Your first anniversary is a major milestone, and cause for a wonderful celebration. 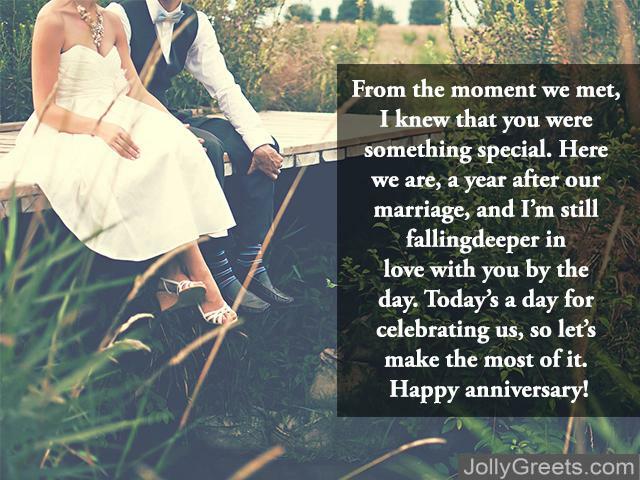 Take the time to tell your husband how much you love him and how much he means to you–after all, your first wedding anniversary only comes around once! The messages listed below are the perfect way to make your anniversary special. With these thoughtful, loving words, this amazing day will be one to remember forever. It’s hard to believe that only a year ago I was walking down the aisle in a white dress, looking into your eyes and saying, “I do”. Since then, my love for you has only grown, and you mean more to me than I could have ever imagined. Happy first anniversary, let’s celebrate our love all over again! One year of joy, laughter, and love. I’m so proud to be your wife, and I couldn’t imagine spending my life with anyone else. Happy anniversary, I love you so much. From the moment we met, I knew that you were something special. Here we are, a year after our marriage, and I’m still falling deeper in love with you by the day. Today’s a day for celebrating us, so let’s make the most of it. Happy anniversary! A year after our wedding day, and I’m still falling for you. Our future together couldn’t be brighter, and I can’t wait to see what’s in store. Happy anniversary to the best husband a woman could ever hope for! You are an endlessly special person to me. You’re my other half, my best friend, and my handsome husband. Today’s our anniversary, and I’m so excited to celebrate with you. I love you! Today is a celebration–of you, of me, of our partnership, and of our love for each other. You mean more to me than you know. Happy anniversary to my incomparable husband, I love you so much. The joy that I get from being with you is such a gift. Today’s our anniversary, and I’m bubbling over with happiness. Happy anniversary, I love you! My darling husband, when I’m with you, I’m happier than I’ve ever been. Your kindness, humor, and wit are just a few of the many reasons why I love you so much. Happy anniversary! Being your wife brings me pure, uninhibited joy. 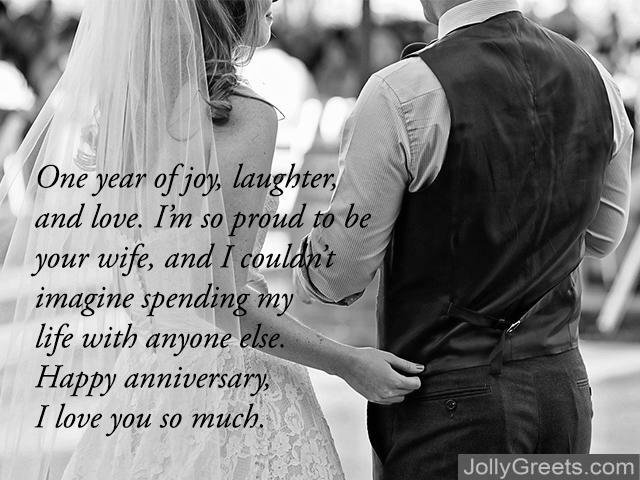 I’m so glad we’re together to celebrate one year of our beautiful marriage, and the many years that are to come. Happy anniversary, I love you! An anniversary is more than just another day–it’s a day for looking back on the amazing memories we’ve shared, for appreciating one another, and for looking ahead to the wonderful things to come. Happy anniversary, I love you so much! When I look at you, I can’t help but smile. Being with you is a gift, a joy, and something I’ll never take for granted. Happy anniversary, my incredible husband, I love you so much. My exceptional husband, in all the time I’ve known you, you have been there for me through the good times, the bad times, and everything in between. We’ve shared everything with each other, and simply being by your side gives me comfort and joy. Happy anniversary, my dear, I love you so much. Today’s the day we look back on our first year of marriage, appreciate our relationship and our love for each other. You’re always there for support, love, or just to make me laugh. Happy anniversary, I love you so much! You have loved me through the darkest times and stood by my side when I needed support. It hasn’t always been easy, but I can’t imagine my life without you. Today, let’s celebrate our undying love for each other, and the boundless happiness that you bring me. Happy anniversary, I love you! Your love for me is something I cherish each and every day. I hope you know that I love you more than anything, and I will be here through it all: the ups, the downs, and everything in the middle. Happy anniversary, dearest husband, I love you so much. From the moment I saw you, I knew you were something special. Here we are, one year after our marriage, and I’m falling more and more in love with you every day. Happy anniversary, my wonderful husband. Loving you is like breathing for me. You are the most important person in my life, and I will always be by your side. My loving husband, happy anniversary! You are so kind, courageous, thoughtful, and handsome. I’m so lucky to have you in my life. Happy first anniversary, my dear, you are simply extraordinary. I couldn’t imagine spending the rest of my life with anyone else. I love you so much that it’s as if you’re a part of me. Let’s celebrate our anniversary, the memories we’ve made, and all the good times still to come. Today is only the beginning of our lifelong journey together; just one milestone on the long path that we’ll travel by each other’s sides. Happy anniversary, my lovely husband, you are everything to me. Today marks a wonderful event that you and your husband will cherish for the rest of your lives. One of the lovely messages above will take your anniversary above and beyond!